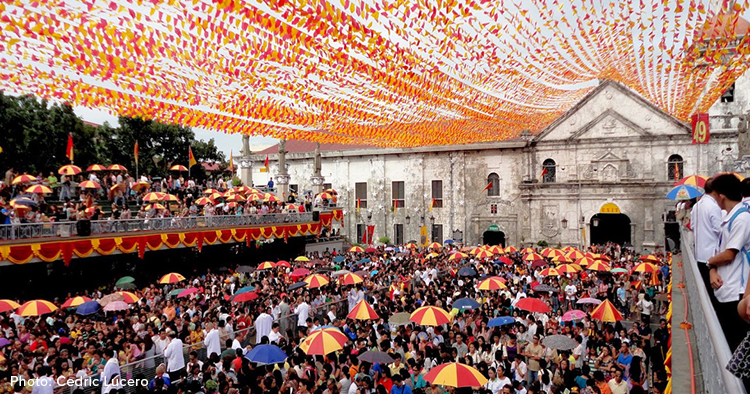 Every third Sunday of January, the city of Cebu in the southern part Philippines celebrates what is called the Sinulog-Santo Niño Festival. Considered to be the first and the biggest annual festival in the Philippines, it attracts millions of people from all over the world, Filipinos and foreigners alike. For locals here, the Sinulog Festival is more than just a celebratory event. It is also an occasion that celebrates their religions devotion — to commemorate the importance of the Sto. Nino in the lives of the Filipino people. Sto. Nino, also known as the Divine Infant, has been central to the religiosity of people in Cebu and other parts of the Philippines. It has been a symbol of hope and faith for many believers for centuries now. Another attraction during the Sinulog Festival — especially to foreigners who flock to Cebu — is the various street parties that often happen during the occasion, Normally, it takes places the night before (Saturday) and the night of the main festival (Sunday). We here at Car Davao Rental, of course, would like you to experience this once-in-a-year event, and we would be happy to be assist you with your car rental. Whether it’s the SInulog or whatever purpose you have in mind, our team is available 24/7 to help you book a car. Just give us a call or SMS us at 0945-238-4283. You can also email us at jason@carrentaldavao.com or book via our Book A Car page. Whether it’s for a business trip or vacation, Car Rental Davao offers its renters a wide range of quality vehicles suitable for any budget and occasion. All our car rental agency’s vehicles — ranging from sedan to sports utility vehicle (SUV) to van — are all less than two years old and are extensively maintained, guaranteeing a safe and hassle-free road trip for our customers.